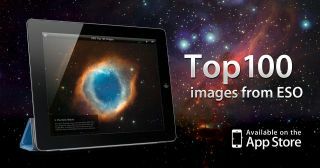 The ESO Top 100 Images app is a free iPad app that brings users a selection of the best astronomical images taken by ESO’s ground-based astronomical telescopes from the Atacama Desert in Chile. Among the features of the app are captions and links for more information, a wallpaper option, slideshow play mode with background music. Space — the iPad’s the final frontier. And it is a truly spectacular frontier. It stretches out beyond our imaginations, providing no shortage of star power, nebulas and quarks for inquisitive minds that for ions have looked up and wondered what lies beyond. Now those minds can be satiated in a myriad ways, and a new app from the European Southern Observatory (ESO) is helping turn the iPad into a portal to the stars. This app, dubbed the European Southern Observatory Top 100 app, features 100 images taken by some of the world’s most advanced ground-based telescopes, located in the Atacama Desert in Chile. From the VISTA’s infrared view of the Orion Nebula to the dark heart of the Milky Way (and a few images from the ground), there are 100 photos of intergalactic beauty. Each of these images is displayed in high-definition, showing every detail of various constellations, nebulas and galaxies. Each one comes with a supplementary description — which can be removed or expanded with a simple screen tap — describing the images in extraordinary detail. Along with a helpful user-friendly setup (simply drag your finger across the screen to change images), the ESO Top 100 app also comes with additional features. A slideshow mode is available, with images automatically shifting from one to the next, while music by Celtic Dream plays in the background. The images can also be easily transferred to the iPad’s photo album, which in turn can be used as digital wallpaper. Best of all, the ESO Top 100 won’t leave an astronomical mark on your wallet. It’s available free of charge, and takes up a small amount of memory at only 45.4 MB. This story was provided by iPadNewsDaily, a sister site of SPACE.com. What Makes the Strong Force So Special?